August 17, 2014 – I went rappelling and rock climbing on Mt. Erie (1,273 ft. elevation) with the gang. 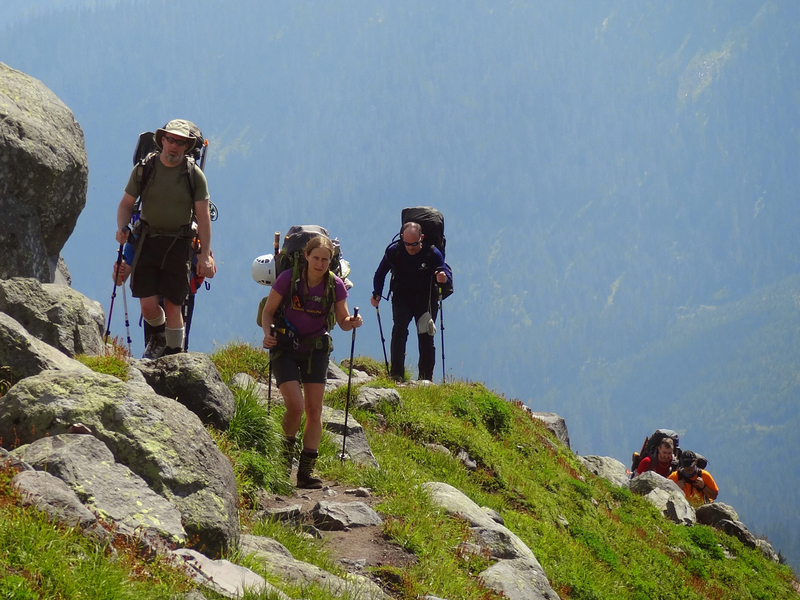 August 18-22, 2014 – I went to American Alpine Institute’s “Alpinism 1 – Introduction to Mountaineering” course on Mt. Baker with Tomas, Jes, Ashton, Jared and Sean. Three others joined the class, Ryan, Ryan and Alex. 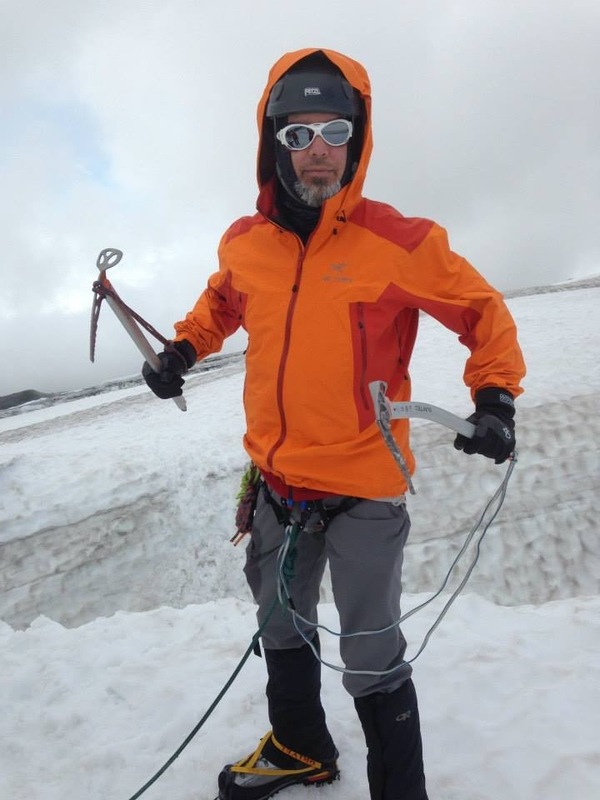 The course covers fundamental skills of rock, snow and ice climbing, glacier travel and crevasse rescue. The final day includes a summit of Mt. Baker (10,778 ft.). Sadly due to GI issues, I was unable to participate in the summit attempt. August 23, 2014 – I went on a walking adventuring around Seattle with Sean and bumped into some cool places: REI’s flagship store and the Feathered Friends shop. Travel: I flew Delta (first class for the first time on a full RT flight) from RDU – SLC – SEA and return was SEA – MSP – RDU. It was nice to be able to check 3 bags free. Jes, Sean and I took the Bellair Bus from SEA to Bellingham where we caught up with AAI. Guide Service: American Alpine Institute (AAI). Our Guides were Kai and Dillon. They were excellent. 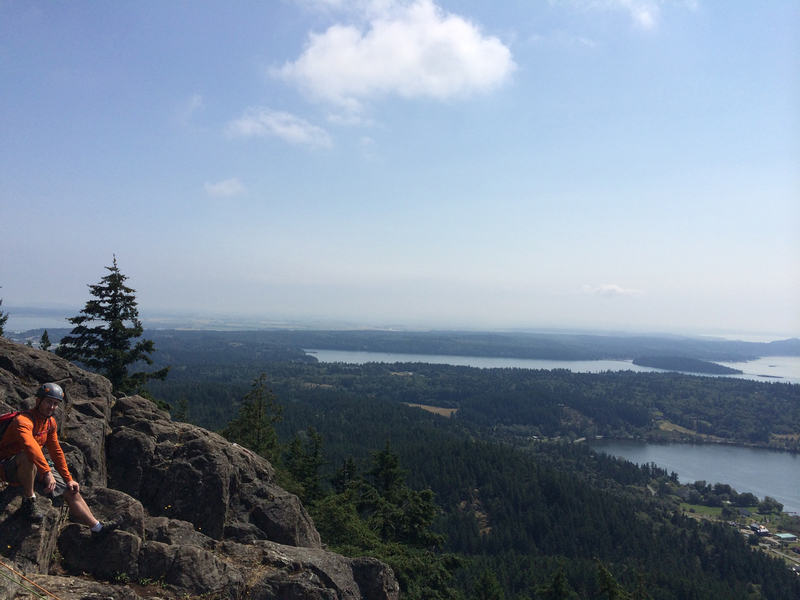 Day 1 – Sunday, August 17, 2014: It’s a nice day for rock climbing on Mt. Erie, almost a bit too hot in the sun. We first went over a few knots, prusiks and getting on a rappel. We did a 40-50 ft. rappel to the base of the crag and proceeded to climb a few routes. One of the 5.7 climbs had a great crack for a fun 4 ft. tall layback, though there were many ways to climb that section. We also learned how to use waist and foot prusiks to ascend the rope, a technique which might be needed to ascend a rope when down in a crevasse. It was an overall fun day. We headed to a nearby State Park campground for the night ready to head to Mt. Baker the following morning. No journal entry written today. View from top of Mt. Erie rappel site. Day 2 – Monday, August 18, 2014: Today’s goal was to take our packs full of gear on on backs, hike up to Sandy Camp (5,900 ft.) and setup camp. We enjoyed nice sunny weather for the hike in. The trail is called Railroad Grade Trail, though it is far from the low angles of a true railroad grade. Starting elevation was 3,300 ft. from the parking area. Myself and others did this hike in our mountaineering boots. My heels were completely blistered. My pack was also very heavy and I was not as well trained as I should be. Had I known in advance more detail on what the hike to camp would be like, I would have most certainly worn my regular hiking boots and put the additional 9 lbs. of my mountaineering boots on my pack somehow. I may have escaped injury to my heels in my regular hiking boots. View of Mt. Baker while hiking up Railroad Grade Trail. Photo by Jesica Mangun. Further up Railroad Grade Trail looking back at Ashton, David, Ryan (hidden), Jared, Tomas and Sean. Photo by Jesica Mangun. Day 2 – journal excerpt: So this is my first journal entry… And for now it is on my iPhone. I left the writing tablet in the van so I’ll transfer this to that when we get back off the mountain. Briefly I’ll talk about yesterday August 17, 2014. We went rappelling and rock climbing in Mt. Erie and learned how to ascend/descend a rope with prusiks. Really neat. We’ll apply that on the glacier to get out of crevasses most likely. Today was really tough. I have no idea what my pack weighs, but the simple answer is too much. And I already left some things behind. I forgot my solar charger, even forgot the battery pack and I’m carrying the batteries. Wasted weight there. I also left a layer in the car I intended to bring as a spare. I think my layering system is good so I should be OK. Being on the glacier tomorrow will be a good indicator. Why was today tough? Improper training! I haven’t been mtn biking as much as usual due to all the weekend rain. But, no excuses there since I have an exercise bike. I definitely did not hike enough. Oh, and while the company mill hikes in my mountaineering boots went well, nothing prepared me for the steep inclines. My heels are somewhat torn up. When we hit the steep section my feet went from great to bad. My right heel got a blister and my left heel a good hot spot, maybe worse, don’t know. It is currently covered with a piece of duct tape. My right heel has mole skin with a hole in it for the blister and also duct tape. I also managed to get dehydrated on the hike. We covered 4 miles and 2500 ft. of elevation in 3 hours, a pretty wicked pace. Just after dinner we had a couple fighter jets fly over. I’ve drunk more water, peed well and will drink more through the night. Hopefully I don’t have to get up and pee just simply for being lazy but if I do, that’s good for my hydration. I crawled into my tent at 7:25. It will be another 1.5 hours before total dark. Tomorrow we hike up and work on glacial movement with our ice crampons on. Hopefully the weather holds and we have a good day. Oh, and even here the humidity has seemed high and I’m sticky and gross feeling already. I washed my legs good but they still feel icky. My face feels gross from all the sunscreen. Day 3 – Tuesday, August 19, 2014: We jumped right into training today. The instructors covered snow movement, self arrest techniques and more. We did a LOT of sliding down the hill in various positions to practice self arresting our slide, including superman style (head first) and head first on our backs! Once we were done in the snow, we headed to the ice for ice movement with crampons on. I enjoyed all the instruction and practical application. My heels didn’t hurt all that much but one blister popped and the other got a little worse. My right heel was covered in moleskin and duct taped and I duct taped my left heel too. Duct tape wrapped on my poles or Nalgene is something I need to remember for future adventures; thank you Sean for the duct tape on this one. View from our first training session site where we practiced snow movement and self arrest techniques. Day 3 – journal excerpt: Today was a lot of snow movement, self arrest and glacial movement in crampons training. The snow movement was pretty basic. Use our boots and sheer a shelf for them to stand on… crossover, shuffle and duck walk. We learned proper placement of the ice axe. Then we used our crampons for snow traversing as well. The self arrest was a lot of work. We used the ice axe and sat on our butts and slid down a hill, superman down the hill and on our backs head first down the hill and had to stop ourselves from sliding down the hill. We practiced with our packs on too. Up and down and up and down the hill. Next we put the crampons on and started learning how to use them on glacial ice. We can stand in one place and turn a full 360 with small steps and feel all angles while on hard ice. Next we traveled up the glacier a bit and just followed the leader taking us over various terrain. To end the day we came down a ridge along the Easton Glacier. We also learned how to set a snow anchor and back it up. We learned about setting the rope up for glacial travel and how to tie the butterfly knot. Also, how to butterfly coil and mountain coil rope. Long day. We go out on the glacier more tomorrow. Oh, my heels are definitely blistered. The right one popped. This afternoon and tonight my feet dry out and tomorrow we rewrap my heels. I can feel that I didn’t put enough sun screen on my shoulders and neck. 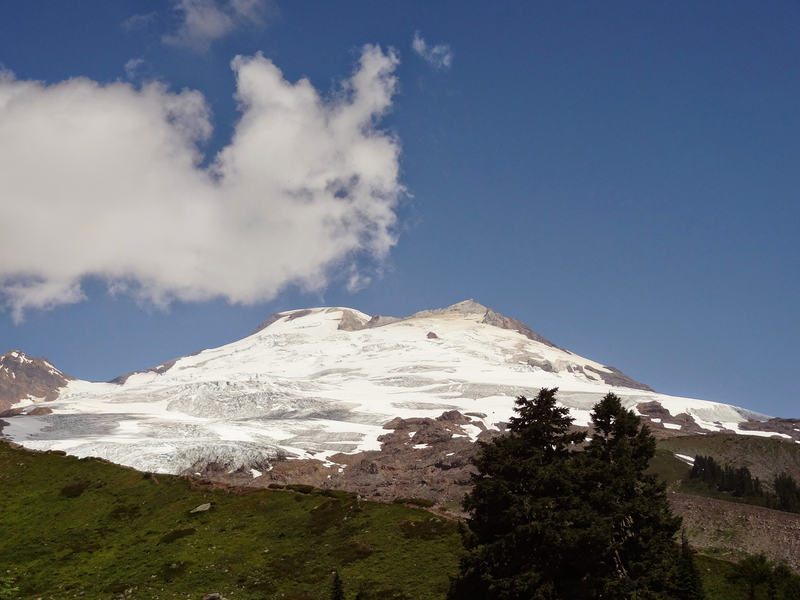 Day 4 – Wednesday, August 20, 2014: Today was our fun day out on the glacier. We were able to put our practical training on glacier traversing from yesterday to use while heading up to climb out of the cracks. On my first climb I only had 1 ice axe which I think made it more difficult. On my second climb I had 2 axes and it was really awesome, made a huge difference. At our next ice climbing spot I belayed Jes on what was a super challenging ice wall down inside the crack. Jes is strong willed and made it out. My belay was on a snow anchor with a Munter hitch on a locking carabiner. In the evening back at camp we talked about mechanical advantage which would be applied to the crevasse rescue rig the next day. Tomas and I traversing the glacier on the way to our second crack climb site of the day. Photo by Jesica Mangun. Me in full ice climbing attire. Day 4 – journal excerpt: Today was an exciting day. 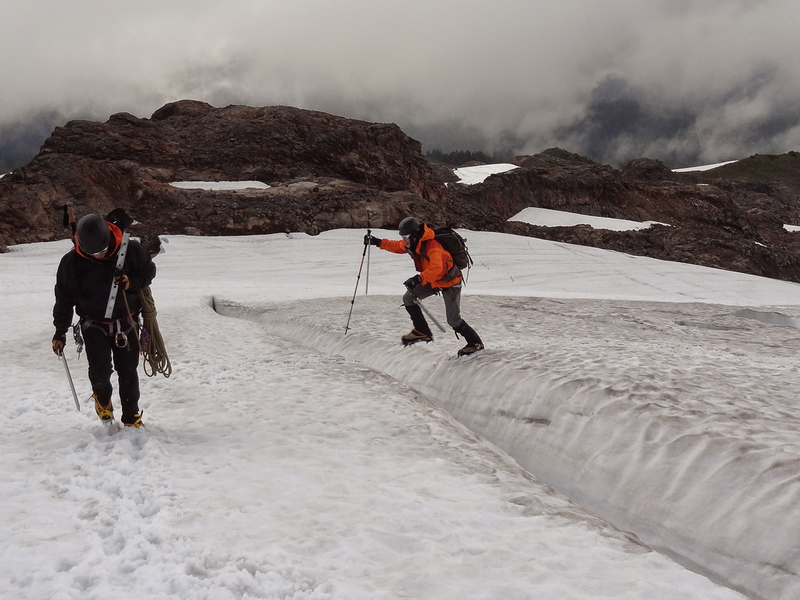 We put our glacial traverse training to practical use and toured around the Easton Glacier. Part of the touring was searching for crevasses we could drop down into and ice climb out of. The first climb with only one axe was pretty tough. My feet closer to my toes were cramping. We moved to another spot and used 2 axes and it was loads of fun, little to no foot cramping. Perhaps I just got a little better technique. We moved on to an even tougher spot. One of which was like dropping people down a hole into the crevasse. I was on belay for Jes for a long time while she worked out of a really tough and deep climb. I opted out of climbing at this spot. Belaying with a Munter hitch for a long while can be tiring, so I decided to conserve energy. We came back off the glacier and at camp learned about mechanical advantage in systems and rigs used to rescue people from a crevasse. Mostly we just learned about the Z rig which is 3x and how to make that 6x, though friction removes some of that mechanical advantage. Tomorrow we hit the glacier again to do practical crevasse rescue. Our guides say we are going to sweat our asses off from hauling. I believe them! Ki ? (Get spelling) and Dillion are great. We opted to start the summit early Friday from our base camp instead of a bivvy camp 1000-1200 ft higher. Fun day! Oh my heel blisters are managing. Bandages and duct tape. I have to remember to start rolling duct tape to my trekking poles. Very handy stuff. 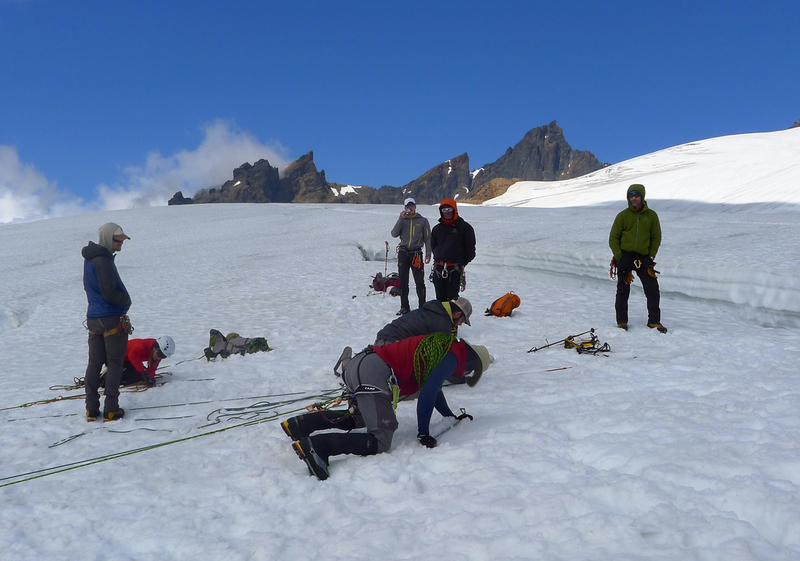 Day 5 – Thursday, August 21, 2014: Today was the day for the glacial crevasse rescue demo and practice session! For me it was the highlight of our training. The demo was led by Kai and was excellently done. The full session video has been shared on YouTube (link below) Some people elected to practice with a 40 lb. backpack, some took on a human. I originally chose backpack but Jes wanted to be my victim and such was set my task to rescue Jes. The beginning of my practice rescue of Jes who is dangling in the crevasse on the other end of the line. 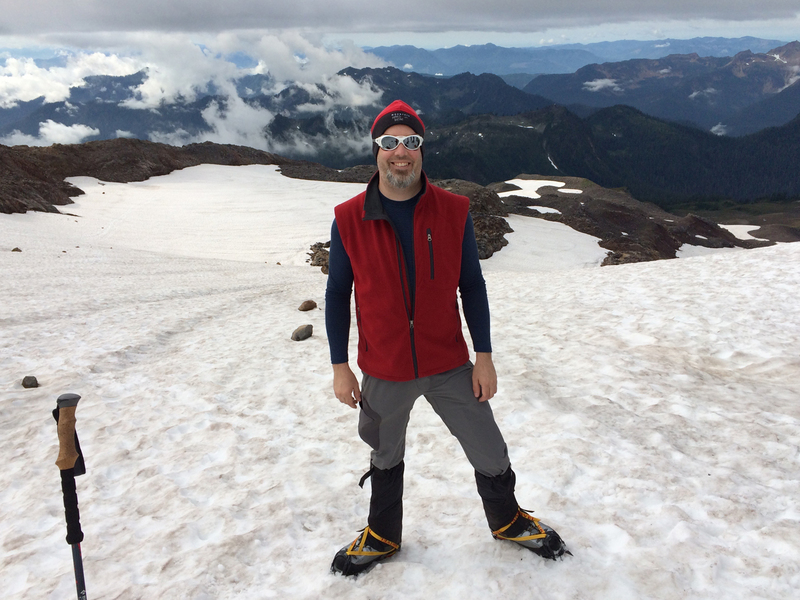 Day 5 – journal excerpt: Today was a really neat day… crevasse rescue. We put to practical use the mechanical advantage rigs we learned yesterday. After a full demo by Kai, we all took a turn. Options: backpack or human in the crevasse. I was originally opting for backpack but Jes wanted to go over the edge so I took her on as my “anti-climber”. The guides had a safety rig setup of course. She said “falling!” and I hit the snow to arrest her fall. While I stopped her, the safety line kicked in also. According to Kai, if there had been 5 more feet of rope on the safety line I would have had her on my own. Either way, all the weight is transferred entirely to me (safety line still on but slack) and I had to complete the rescue. That is a long, hard process. I have video of the entire demo. At the moment I have no idea what photos or videos were taken of my rescue of Jes. I can tell you with the amount of work it takes 1 person to rescue another, I hope to be on rope teams of 3 or more in the future to simplify rescue. More people = more resources. Ashton was brave and took on rescuing Alex who is much bigger than she. It was a hard battle but she did it. Sean was first human anti-climber. I have some video of him going over and hanging in the crevasse. On to some other news… while my heels are surviving with the aid of bandages and duct tape, my guts are all messed up. Was it all the energy bar type food or the really processed summer sausage I brought that got me, I dunno, but once you’re roped to the team, you don’t come off rope and I decided I didn’t want to put a rope team through that with me. Nope. Bummer. I’ve had a blast this week, and at least for the moment, I’m not upset I can’t go for the summit. I can hire AAI for a customized trip and come back next August if I chose to. No summit glory, not this time. 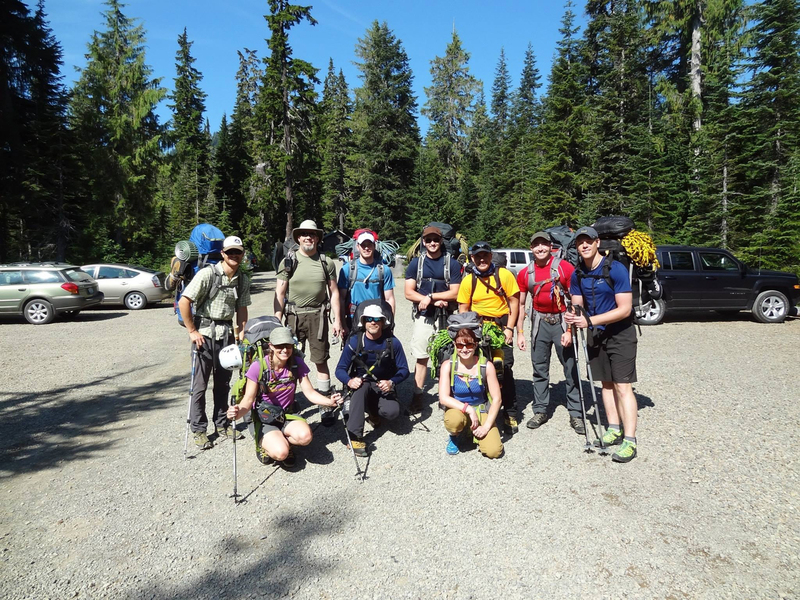 Day 6 – Friday, August 22, 2014: The team left at what I recall was either 11pm or 1am to start their summit hike. Tomas and I stayed at camp. We eventually motivated to break camp, pack up and start the hike back down to the parking lot. I was surprisingly not disappointed at not being able to go for the summit. I had a great time learning everything throughout the week.